Sister Miriam Therese Harder, OSF began thinking about a religious life was she was in grade school in Rochester, MN where she was influenced by two teachers. A few years later, after completing high school, she began working at St. Mary’s Hospital in Rochester where she met three Hospital Sisters who were beginning a dietetics internship. “Since I was looking around for a Congregation that I wanted to join, I asked one of the Sisters where she was from,” Sister Miriam Therese said. “Eventually they invited me to visit their Motherhouse in Springfield, IL and after spending a week there I was so happy and felt that this is where God was calling me. I was impressed with the Sisters’ prayer life and their compassionate care to the sick, and I entered the Congregation four months later,” she said. Following her graduation from St. John’s School of Nursing, Sister Miriam Therese worked as a nurse in the surgical department at St. Vincent Hospital (Green Bay, WI) and St. Elizabeth’s Hospital (Belleville, IL). In 1947, the need for a nurse in the Admitting Department to take Doctor’s order became evident. 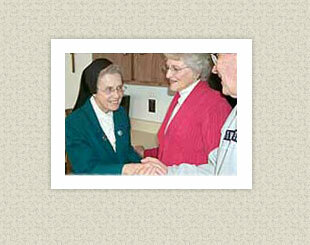 Sister Miriam Therese pioneered in this position in several of the Sisters’ hospitals. This required skills in understanding physician’s orders and in placement of patients. She spent 32 years in this capacity. In 1979, she was chosen to serve as Provincial Secretary. She missed serving patients directly and after nine years as the provincial secretary she asked for the opportunity to serve in Pastoral Care in the hospital. She served in this capacity a number of years. In 1995, she returned to Sacred Heart Hospital to serve as the hostess at the St. Francis Hospitality Center, care for the Hospital chapel, and provide services to residents of St. Francis apartments. “Our Hospitality Center is for cancer patients who come from a long distance for radiation and chemo treatments and need a place to stay,” Sister Miriam Therese said. “I’ve met many wonderful people doing this job and love Sacred Heart Hospital,” she added. Her co-workers willingly shared their sentiments and those of visitors to the Hospitality Center. “Sister Miriam Therese is a person that has a wealth of compassion and commitment to all she comes in contact with. She is very detailed in making sure everyone is comfortable and has what they need. She is also very sincere in the spiritual needs of all,” wrote Rick Beckler, director of Hospitality Services. “Our patients report that Sister Miriam Therese is very attentive to their needs while they are at the Hospitality Center. All the patients praise her for her caring and support and she does a wonderful job of making patients feel at home,” explained Brenda Clausen, Cancer Center receptionist. On the occasion of the 125th anniversary of the American Province, Sister Miriam Therese and Sister Joel Jacobi reenacted the Sisters coming to America. Both were dressed in the traditional black habit and took a horse and buggy ride depicting the begging for food that the Sisters did in the early years to provide food for their patients and themselves. “While this probably was a difficult task at that time for the early Sisters, it was a fun ride for us,” Sister Miriam Therese said. In 2002, she celebrated her diamond jubilee as a Hospital Sister that coincided with the ground breaking ceremony for the addition to Sacred Heart Hospital in Eau Claire, WI. At that time she reflected on her life as a Franciscan: “I have been happy in my life of prayer and community. In every place I was missioned, I enjoyed my work,” Sister Miriam Therese concluded.